Dennis Bergkamp is perhaps one of the most interesting players to watch on the soccer field during his playing days. 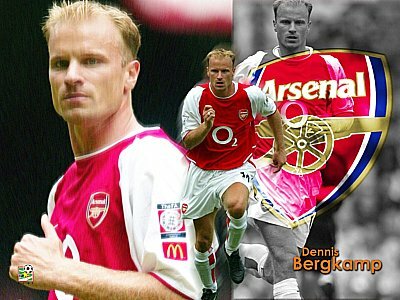 This player made soccer fun to watch as he would try the impossible and at most times he would make it possible earning himself the nickname Dennis Bergkamp The Artist. Dennis Bergkamp biography shows him scoring impossible goals and making impossible passes which in part brought him fame as a soccer player. He is also one of the few players to stick with the same club throughout his career, although he could have gone to any club he wanted to for a very high transfer fee. Born in Amsterdam, its no wonder that Bergkamp would start his career as a youth player with one of the best youth soccer clubs in the world Ajax at the age of 12. After spending 5 years with the club, Dennis Bergkamp signed his first professional contract in 1986 at the age of 17. Dennis Bergkamp profile shows that his professional debut came on 14th December, 1986 against Roda JC. Coached by great Johan Cruyff, Bergkamp became a regular starter the following season helping Ajax win titles and also earning the nickname for himself Dennis "The Van Man" Bergkamp. During his career at Ajax, Bergkamp scored 122 goals in 239 all competition matches. After 12 years with Ajax, Bergkamp made a move to Italian soccer with Inter Milan. However Dennis Bergkamp profile would be stainted during his time with Internazionale as his form dropped dramatically and he would play so bad that he only scored 11 goals in 50 matches. His poor form was not the only problem as Dennis Bergkamp had a hard time getting along with the team. What made things worse is that Italian media started to make fun of the Dutchman by renaming their "donkey of the week" (worst player of the week) award to "Bergkamp of the week". After 2 unhappy seasons at Inter, Dennis Bergkamp was signed by Arsenal boss Bruce Rioch in 1995 for a reported £7.5 million. Dennis Bergkamp biography shows that it took Bergkamp a little while to get used to the English style of soccer/football but his stature in Premier League grew more and more that pretty soon he was considered the best foreign player to ever come and play in the English Premier League. Dennis Bergkamp profile shows that after the arrival of Arsene Wenger in 1996 Bergkamp would truly hit his career best form and go on to win many titles and score many memorable goals during his time at Arsenal. In 2005 there was speculation that Bergkamp would retire if he didn't get one year contract extension with Arsenal but after winning the FA CUP FINAL against Manchester United, Arsene Wenger announced that Bergkamp would get a one year contract extension with the club. On April 16th, 2006 in a home match against West Bromwich Albion, Arsenal supporters would dedicate their "Supporter's Day" to "Dennis Bergkamp Day" as a thanks for his great service to the club. This would also be his last match as he would retire in 2006. On 14th July, 2008 he placed 2nd in Arsenal's Greatest 50 Players in an online poll on Arsenal.com.